I was at Ambrose Farm Market in Cabot, PA last weekend picking up my weekly fix of bread and butter corn. Ambrose is by far my favorite farmers market. Their prices are outstanding and they get even better if you choose to pick your own vegetables. Everything is grown by them and is not sourced from other places. They have a wide range of veggies, ranging from multiple types of zucchini, eggplant, cabbage, peppers, melons, and tomatoes. Upon walking into the store last weekend, it became apparent that pepper season had hit its height. So, with winter use in mind, I picked up a quarter flat of poblano, jalapeño, and Italian sweet peppers ($2.50 ea for a quarter flat) and headed home to the grill and smoker. 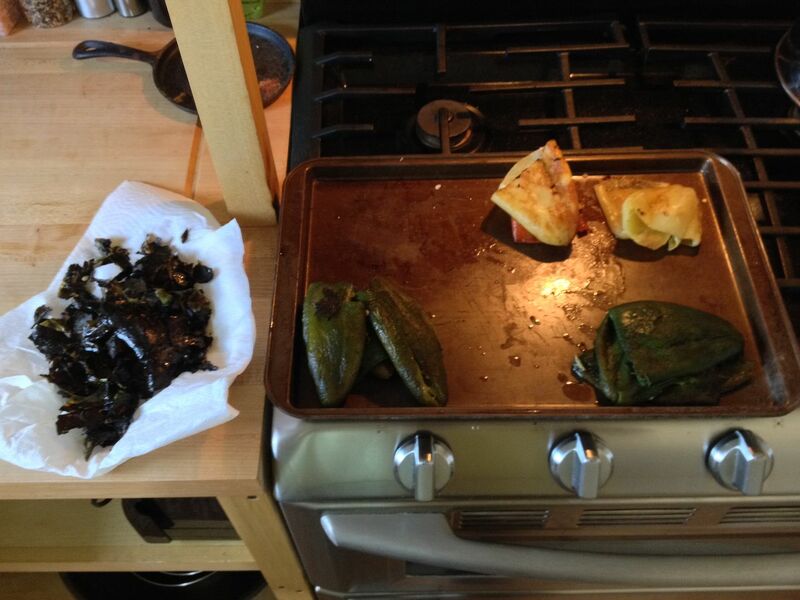 First, I fried up my trusty grill, then I went inside and prepared my peppers. I cut off the tops, removed the guts, rinsed well, and dried. I split the batch in half, some for roasting on the grill and some for roasting on the smoker. First off, the grill. 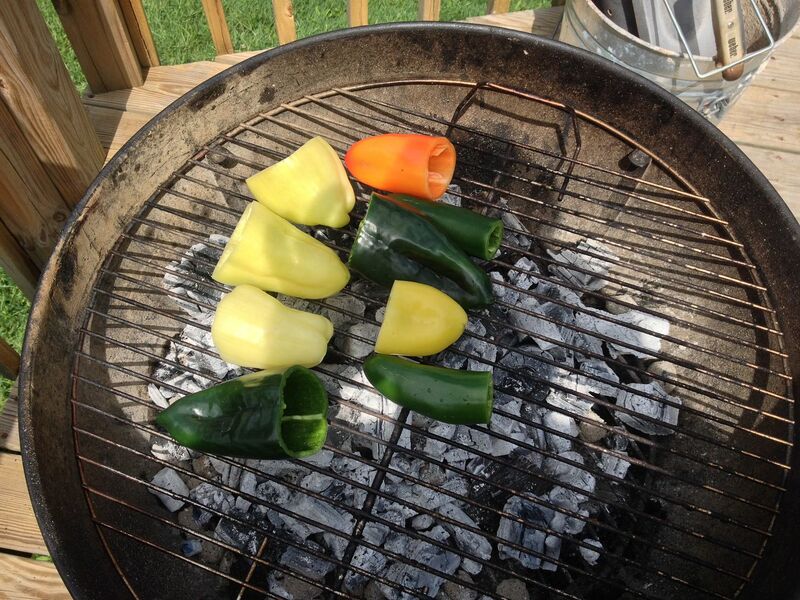 I spread my coals and then started grilling the peppers on direct heat. The idea is to blister the skin on the pepper so it is easy to remove before freezing. 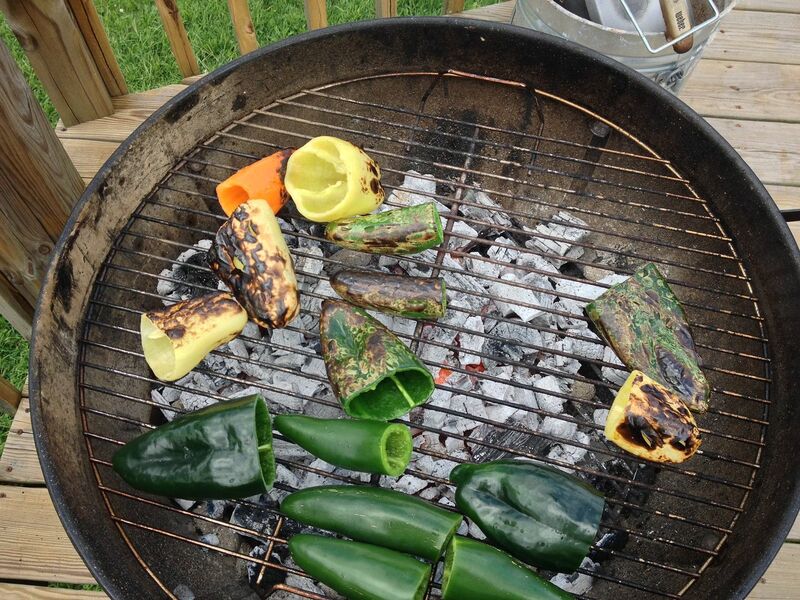 They pop and sizzle, plus the water does start to come out of the pepper. I turned and flipped the peppers for about 10 minutes on direct heat so that they did not burn from sitting too long in one place. 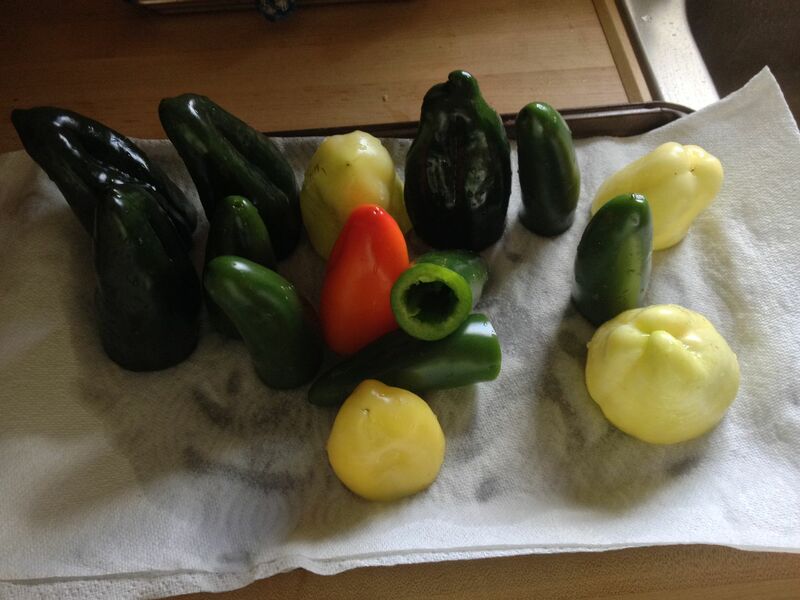 Some of the peppers were started on indirect heat, then rotated over direct heat as others were done. Once all of my peppers were done, I piled them all over indirect heat and put the lid in place on the grill and allowed them to cook for five more minutes to promote some caramelization on the flesh inside. After removing the peppers from the grill, I brought them inside, placed in plastic bags, and covered with a towel to help hold in the heat. 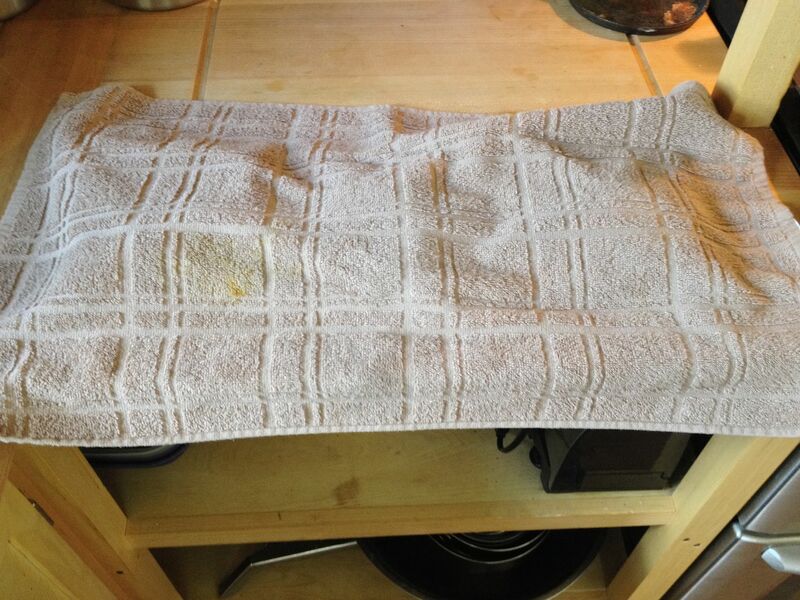 This promotes some extra steaming of the pepper, helping to remove the skin a little later on in the process. Now, the dirty work. Pulling off the skin. 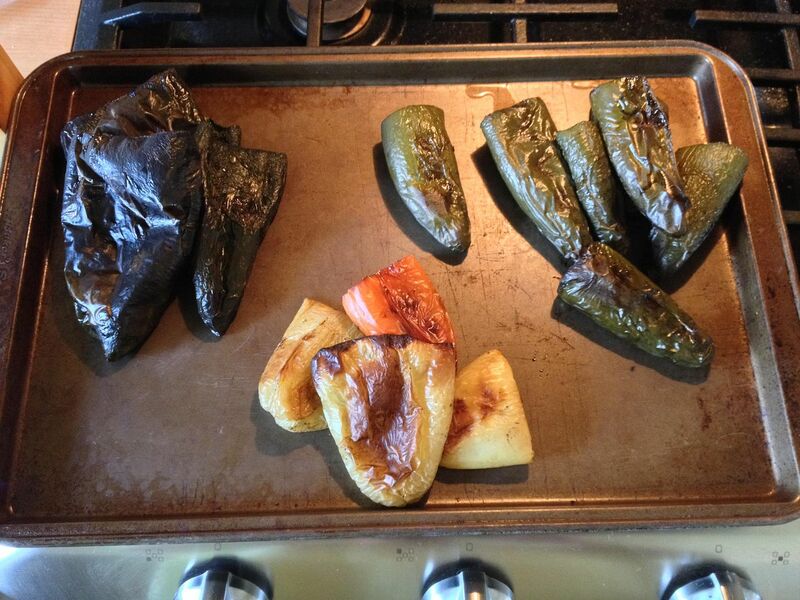 By roasting and allowing the peppers to steam in the plastic bags, removing the skin is easy, but it is a dirty job. I recommend wearing gloves to help with the heat and to protect yourself from the pepper seeds. As you can see, the skin comes right off with minimal effort. While I was cleaning up my grill roasted peppers, I placed the other half of my peppers in my smoker. The smoker was at 400 F and I had some hickory wood in the ash pan. 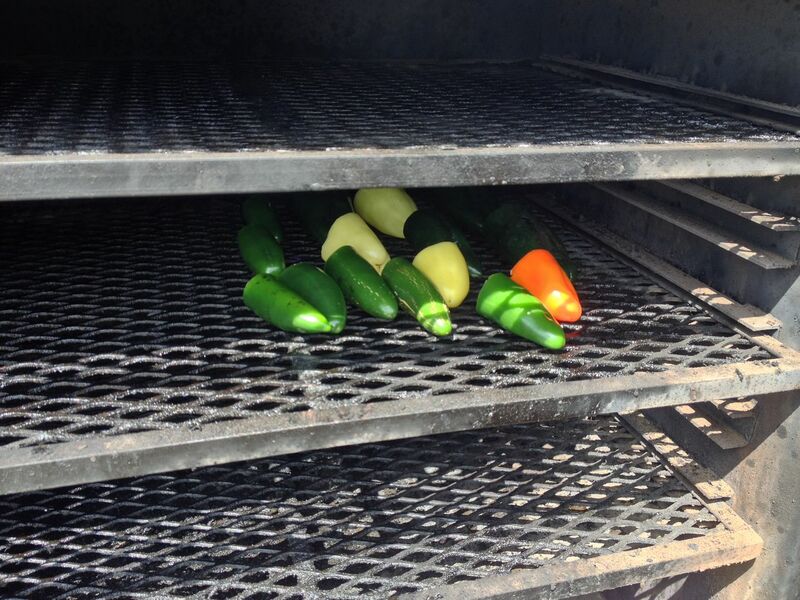 I placed the peppers on the hot side of the smoker. During the process, I flipped them every 20 minutes. After about 45 minutes, I pulled the peppers and repeated the bagging and sweating process. 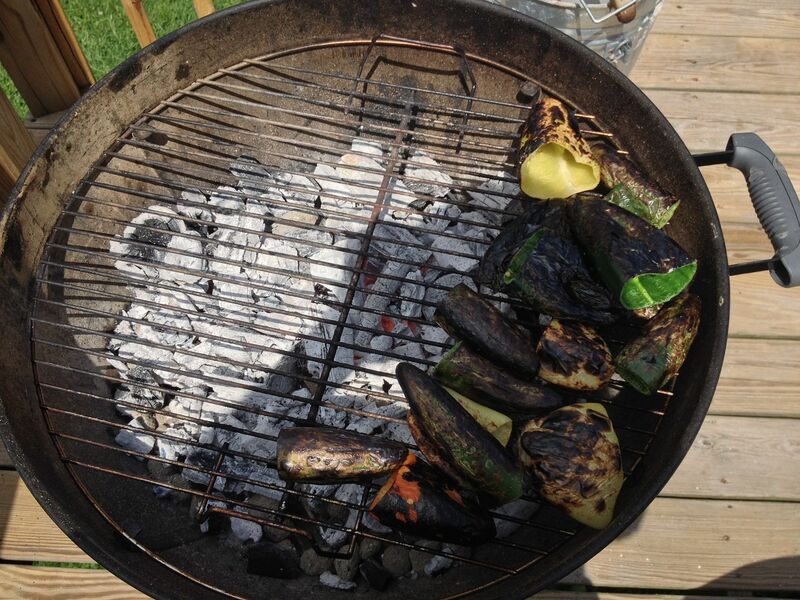 The skin was not quite as easy to remove from the smoker roasted peppers as they were from the fire grilled peppers. The next time, I will let them go for about an hour before removing to ensure the skin will come off of the pepper with minimal effort. 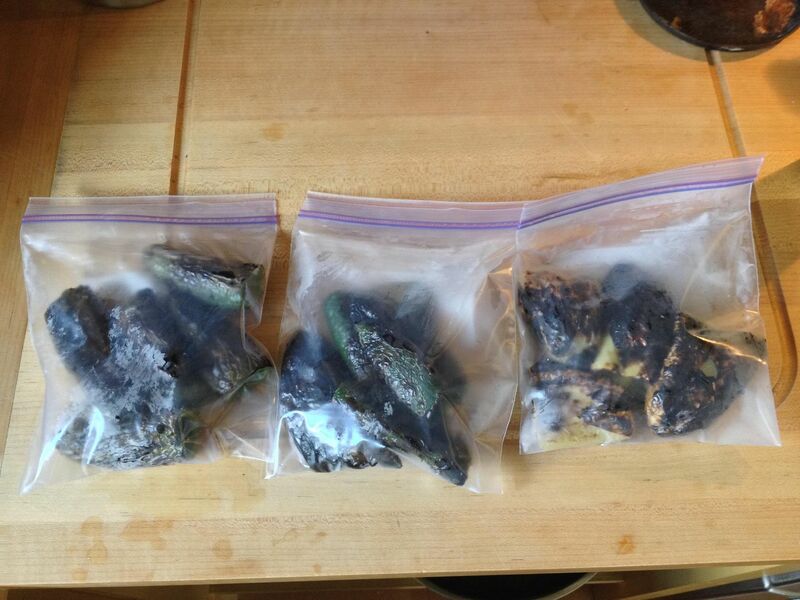 I then separated my peppers into recipe sized portions, vacuum sealed, and froze for the winter months. You will be seeing these in the upcoming winter months making appearances in soups, stews, and chili. I can't wait. 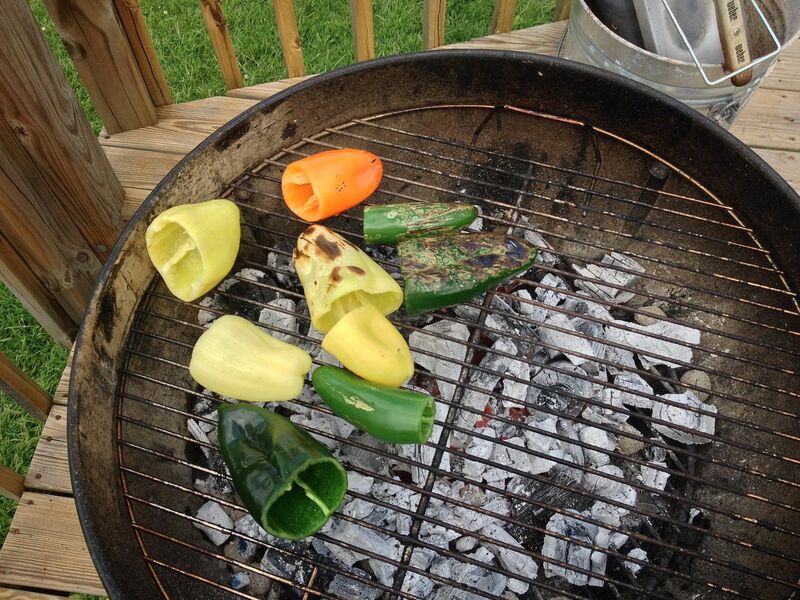 We all have our methods for preparing peppers and yours is unique. We freeze ours with the blistered skin on. While they are still partialy frozen the charred skin easily is removed. At this time you can remove seeds and stem if so desired. This way you do not lose any pepper (water) flavor too. Thanks for sharing your method. Chilebrown, thanks for the tip. I will have to try your method as well. Sounds a bit easier. 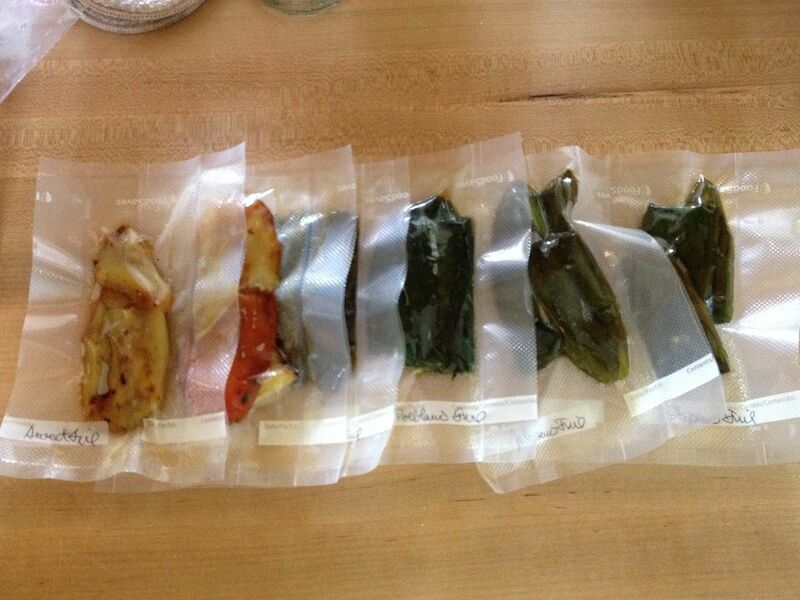 Do you let the peppers rest in bags before freezing? Looks like I have to go back to the farm market. We let them cool down until we can handle them. Put them in bags and let cool down a little bit more. They are still a little warm when we seal them and freeze them. It does not take a lot to blister them. We pull them immediately off the fire. They steam while they still cooling.